Recent news cycle hasn't been supportive for Southwest Airlines. Will probably take until the last quarter of 2019 or 1st quarter of 2020 to turn around. Why the company is undervalued and its share price represents a good entry point. Long-term growth outlook looks solid - but company must execute. For investors following Southwest Airlines (LUV), it's no secret the company has been struggling lately for several reasons, including the public reporting of negotiations with its mechanics, the grounding of the 737 MAX, and questions over the long-term viability of its growth strategy. In this article, we'll look at the impact of the short-term negative catalysts, its long-term growth potential, and whether or not the fundamentals of the company remain solid. The first major headwind that is close to being resolved is the tentative agreement with the Aircraft Mechanics Fraternal Association. After about 6 years of negotiations, and a recent lawsuit filed by Southwest Airlines against the mechanics union in March 2019 over grounded planes that were perceived to come from workers deliberately writing up minor maintenance issues to ground the planes for the purpose of boosting their leverage in the negotiations, it appears negotiations, for the most part, are over and a successful agreement has been reached. This will remove one hindrance to performance and growth going forward. Next is the very public disaster surrounding surrounding the grounding of Boeing's (NYSE:BA) 737 MAX after crashes resulted in safety concerns. As a result of that and some bad weather, Southwest had to cancel approximately 9,400 flights in the first quarter. Southwest has more exposure and vulnerability to the Boeing 737 MAX 8 because it has more of them in operation than any other company. It is also completely exposed to the Boeing brand in general because of its over 750 plane fleet, all of them are 737s or the 737 MAX 8, of which the company at this time has 34 that are grounded. That represents approximately 4 percent to 5 percent of its total fleet. Until the issue with the MAX 8 is resolved, the company will struggle with earnings because its fixed costs remain in place; that mean less revenue and less earnings in the short term. This is the primary reason Southwest had to recently downwardly revise its guidance a couple of times. When it comes out from under the effects of the groundings will determine the performance of the company in the near term. At the earliest, I think it'll be in June. If it takes longer, it'll put further downward pressure on its share price. The worst-case scenario in my view is it could take as long as a year for the company to recover fully from the MAX 8 disaster. Again, it'll depend upon when the aircraft is given clearance to fly once again. Lastly, a headwind that has been part of the company for some time has been what it's going to do to sustainably grow in the years ahead. It recently revealed that Hawaii would be the next major market it competes in, and laid out its long-term plan at the 'J.P. Morgan 2019 Aviation, Transportation and Industrials Conference' in early March. As you can see in the graphs below, Southwest Airlines tends to have fairly prolonged periods of stagnant growth, and then suddenly shoots up as the company implements the next stage of its growth strategy. A major reason for this in my opinion is because the company has engaged in the discipline of maintaining its cost structure while it grows. I think it works on positioning itself for the next growth stage with the idea it won't enter into it until it knows it can do so in alignment with past performance on the earnings side of the business. The first graph shows a prolonged period of a level share price and then drastic pushes upward. That has intensified over the last several years, as the second graph shows, with the time taken to initiate growth shortened. "Beyond Hawaii, we've got 50 more destinations that we are continuing to monitor and examine and consider for Southwest service. That won't be all in a year. That'll be over a long period of time. That equates to the potential to add 500 more aircraft, more 737 aircraft to our fleet. And these are all expansion opportunities in North America and South America. All of that is dependent upon continuing to maintain low cost, low fares and of course high flying service." When mentioning "beyond Hawaii", he was referring to the next major market the company is going to compete in. His latter comments reinforce my thesis that the company will engage in growth strategies that don't or won't undermine its low-cost foundation and customer satisfaction. Since the company appears to be entering into a more aggressive growth trajectory, it suggests it now feels it has a system in place it can scale at a faster pace than in the past. If that's true, we may see growth look more like the last four years than the many years before that. I draw that conclusion from his words and the fact he mentioned the target markets will be North and South America. If the company were to venture into other global markets in a significant way, it would face different challenges I don't think would be solved in the same way they are in this hemisphere. 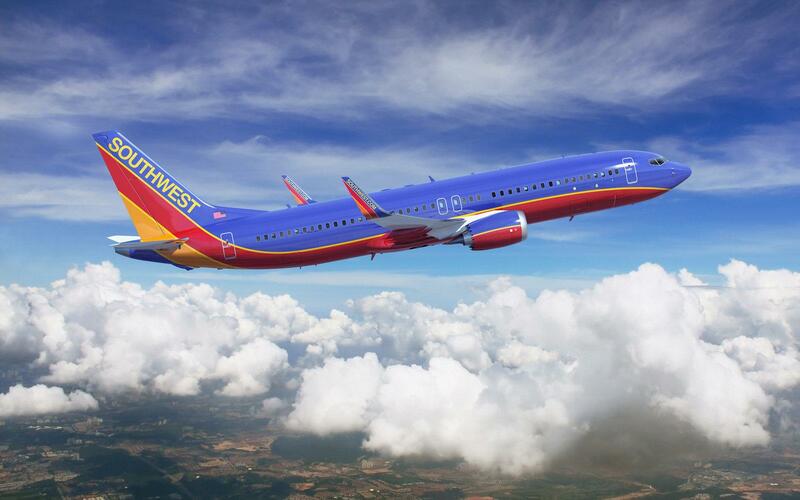 Since Hawaii is the next market Southwest will compete in, it's worth taking a closer look at what that means for shareholders or investors. The first reason I like the move is Southwest has a strong customer base not only in the U.S. but more importantly, as it relates to Hawaii, in California. Southwest, as measured by the number of flights, is the leading airline in California. Along with that, many people living in California travel to Hawaii, so it's a natural fit to leverage that customer base for longer trips. The obvious question is whether or not Southwest will be able to attract those customers that like more pampering on longer flights. The answer is obvious to me: they don't have to. Southwest is built to be a low-cost competitor, and they don't have to attract high-end customers to be successful. Many of the people that already use Southwest in California and nearby states will have few qualms about traveling with the company on a longer trip. There is a huge market for travel from California to Hawaii, and with Southwest looking to grow, it's a terrific opportunity to take some share away from its competitors while boosting its top and bottom lines. Another revenue stream coming from the Hawaiian market is travel between islands, which is now dominated by Hawaiian Airlines (NASDAQ:HA). People vacationing or living in the islands from the U.S. will know about Southwest Airlines and what traveling with the company represents, but many of those visiting Hawaii that aren't familiar with Southwest may opt to go with Hawaiian Airlines. That would mean Southwest must play a long-term game in order to wrest significant share in inter-island travel because of its lack of international brand awareness. Since Hawaiian Airlines has a monopoly at this time, it means Southwest only has to enter into a direct branding war with that company in order to gain mind share among potential customers. That's easier than if there were several major competitors vying for customers. A final thing to consider for Southwest in the Hawaiian market is the company was also built with the short flight in mind, so offering services between islands isn't likely to be a hard transition to make. Hawaiian Airlines offers close to 200 flights a day, so I think its growth in the inter-island market will probably be incremental in the early stages. With its strong branding in California specifically, and the U.S. in general, Southwest is positioned well to make a strong showing in Hawaii. It should be a nice growth catalyst in the years ahead. The problems associated with Boeing could slow its efforts down in serving Hawaii in the near term. A few days ago Southwest Airlines announced the 737 Max 8 aircraft will not be part of the company's flight schedule until August 5. That means quite a few markets will be underserved until that is cleared up, and also means the next couple of quarters will generate less revenue and earnings. 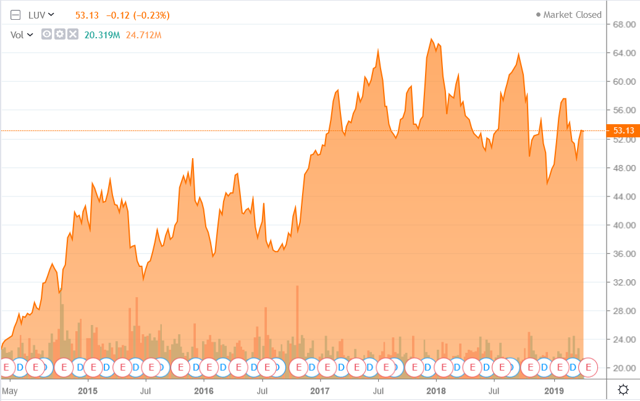 Even so, the share price of Southwest has been very resilient when considering the headwinds it has faced, and I think that's primarily from its communication on its long-term growth strategy, and also because it is still undervalued. With everything going on, the fundamentals of the airline industry and Southwest Airlines hasn't changed. That is why I think it has found support in otherwise bleak short-term headwinds. Maybe one of the more important elements concerning what I consider a low valuation of the company is that it's trading at approximately 10X its free cash flow for 2018. That's really low when taking into account the strength of the company's balance sheet and its consistently strong margins. In the short term, Southwest is going to continue to go through some pain, but over the long term, I really like the prospects for the company, especially in light of its seeming move toward a more aggressive growth strategy. 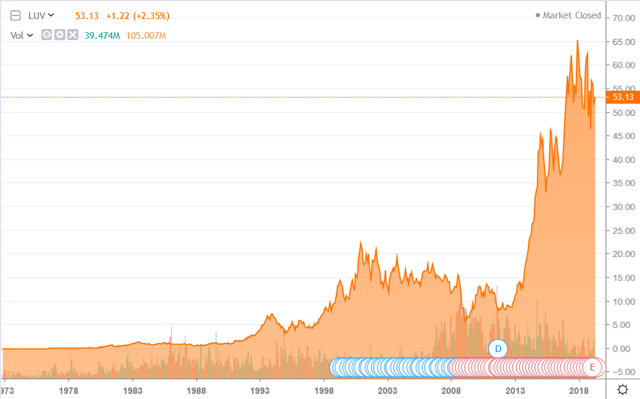 I think Southwest, even though it has moved up a few dollars in share price recently, is still undervalued. This is a great time to take a position and hang on for the long haul, as nothing fundamentally has changed with the company. With over 45 years in a row of profits and continuing to earn the highest customer satisfaction scores in the industry, Southwest is poised to deliver solid returns for investors for many years.